CospLAZY: Ratchet and Clank Plush Patterns- Body and Clothes! 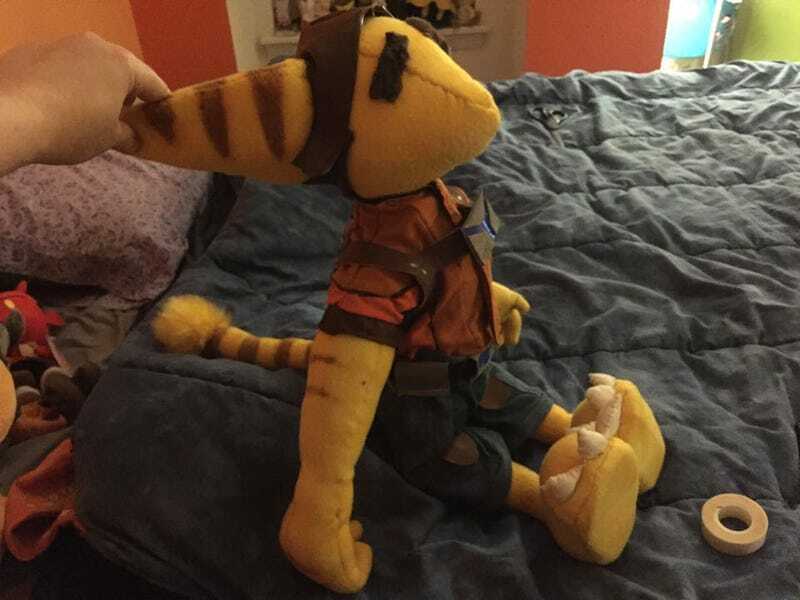 I’m making custom Ratchet and Clank plushies. As with my cosplay post, this will be updated as I add things. For now, here’s a completed male Lombax and pattern. I’ll also be adding mods to make a female lombax, Clank, and clothing for your little cuddly space-cat. These do NOT include seam allowances. Make sure to add in about 1/3 inch. Right click and open image in a new window, then print these on 8 ½ by 11 inch paper. Plush will be bout 24 in (60cm) tall. The nails shud be made from scrap white fabric (dollar store handkerchief works well). I also added in 1/8 inch armature wire to my plush, in the ears, arms, fingers, legs and tail for poseability. You’ll need about 2/3 one pack for that. Forewarning: this is NOT a beginner’s pattern, assumes you already know sewing basics. You CAN do this with only a needle and thread, no complex stitching is needed. 1/2 yard (1/2 meter of standard 48 in bolt) fleece, minky, or similarly soft and cuddly fabrics, in yellow. A quilting square or handkercheif (or two) worth of white fabric. You probably have enough scrap lying around the house. This is for the nails, and purely optional, especially if you’re making boots for your little fuzzball. 1. Cut out the pattern pieces, taping the two halves of the hands together. Lay them out on your fleece. 2. Cut out all the pieces with a seam allowance. To make it easier for sewing, I also completely mark every piece. Time consuming, but some of these seams are VERY tight. Sew “big toes” on one side, small on two, and flip inside out. Stuff, then sew right sides together to bottom of feet, overlapping slightly. Set aside for now. Sew right sides together, top and bottom of ear. Flip ear inside out and stuff with batting wedge. Sew two head sides together from nose to neck. Sew in the top of the head, right sides together. The top head piece will curve around, but stop above the cheeks on the backside. Sew the two side pieces together where the top of the head ends. Flip head inside out, stuff, and hand-sew on the ears. This is a good time to use your fabric markers to add in Lombax stripes. Flatten the feet to profile and cut off the rectangular piece at an angle, so the front of the foot is thin while the back is thick, then sew the top of the foot on, wrong sides together, and flip out. Sew the front body to legs, gathering so that the edges of the body and legs meet- this will create hips. Trim the legs down if you want PS2 Ratchet, who did not have hips of any kind. Sew tail, wrong side out, in between the two back center pieces, then sew the legs to that, same as the front. Add on a tail puff if you want to here. Sew front and back together from neck to arm-hole ONLY and set aside. You now have a head, two feet, and a body- time for the hard part, the arms. Separate and pin fingers. Sew hands and flip right-side out. Begin cutting out wire to go into the fingers. This will give structure. Duct tape the finger wire together, then insert the wire frame hand inside the arm. Sew arms into armholes, then straight down the sides to the legs. Sew inner crotch and flip right side out. Cut out cardboard to go inside the bottoms of the feet, so they stay flat when stuffed. Cut out wire for arms and legs so the toy is poseable. Slide the cardboard into the soles of the feet, then stitch the back of the feet up. Sew up the back and attach the head by hand. Add additional stripes to arms (Ratchet, Angela, or Alister, but NOT Kaden) tail, and tummy. Doll clothes patterns and Clank will be coming soon. Time to have a not-naked Lomabx. Like the plush, remember to include a seam allowance. Good? Good.